There are several techniques available, depending on your need. If you want to add JS / CSS files on every page, you will be using dependency injection to inject JS/CSS files directly in the template. If you want to add JS / CSS files only on some pages, you will be using the code approach. 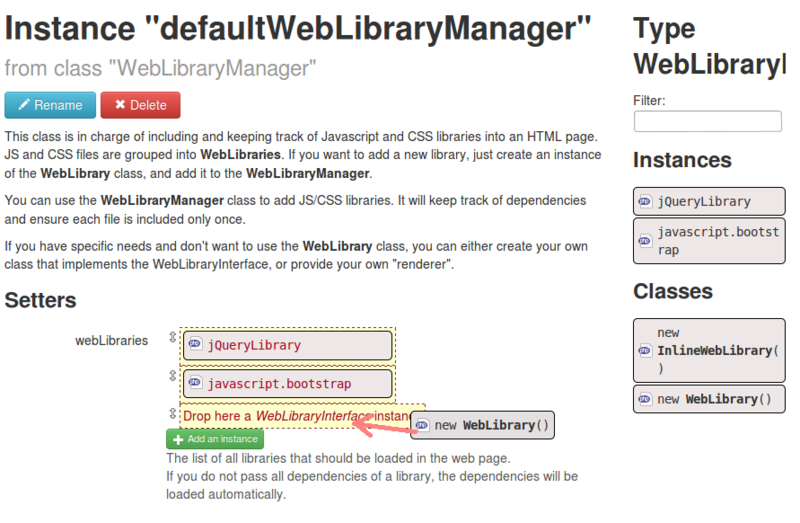 In every case, JS/CSS addition is managed by the WebLibraryManager. The WebLibraryManager is a class that references all the JS libraries and CSS files that are included in a web page. JS files and CSS files are grouped together in WebLibary objects. The WebLibraryManager comes with a default instance defaultWebLibraryManager, that is used by the template. You just need to add a new WebLibrary to the instance list. Then, edit this weblibrary, and add the JS and CSS files you want to include. Sometimes, you only need to import JS or CSS files in one page. In this case, you will perform the addition using PHP code. This code will typically go into your controller. The WebLibraryManager has a built in support for these bower assets. When you insert new bower assets in your composer.json file, the WebLibraryManager will detect those packages and automatically create the WebLibrary instances matching those packages. Note: the included JS and CSS files are based on the "main" attribute declared in the bower.json file of the package. For instance, have a look at the component/jquery package on Packagist. The WebLibraryManager has a built in support for these components. If you import one of those Composer packages in your project, the WebLibraryManager will detect these packages and will automatically create the WebLibrary instances matching those packages. Note: if you import these packages before installing the WebLibraryManager, Mouf will detect the missing instances on the status page and will offer a button to create those missing instances automatically.